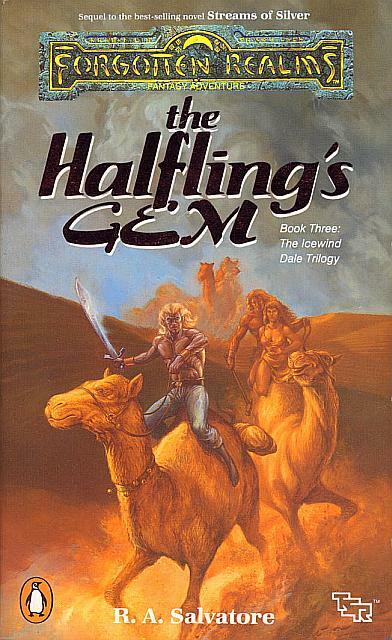 The Halfling’s Gem – Let's Read TSR! The feckless halfling Regis has been kidnapped by the assassin Entreri, and is being taken to Calimshan to be brutally punished for stealing the titular gem from a powerful crime lord. His four friends pursue them, hoping to rescue Regis and defeat the assassin. As such, the first part of the novel is a long road trip where three separate parties (Drizzt & Wulfgar, Catti-brie & Bruenor (not dead), and Entreri & Regis) all make their way southwards, encountering various problems which are often, though not always, resolved by hitting things. Eventually the heroes meet up, cross a desert into a stereotypical Middle Eastern-ish land, and have a giant running battle against Entreri, the crime lord, and about five hundred thousand nameless and disposable mooks. The three separate groups don’t slow down the plot too much, fortunately. I particularly appreciated the Entreri & Regis scenes; the halfling’s desperation and fear add tension and raise the stakes for the heroes’ journey. Without them, it would just be a straightforward road trip story without much urgency behind it. Again, everything’s as over the top as Salvatore can make it. It’s very cinematic, the sort of story where as soon as the narration mentions a chandelier you know for a fact that it’s going to be dropped on someone’s head. So cinematic, in fact, that it lifts one of its scenes directly from a movie: the camel-punching bit from John Milius’ 1982 Conan the Barbarian film. Fitting, since Wulfgar is basically a riff on Conan anyhow. At the beginning of the novel, Drizzt and Wulfgar meet two of the most powerful archmages in the western Realms. Either Malchor Harpell or Khelben Arunsun could have solved the entire plot in five minutes — less time than they spend talking with the heroes, in fact. Instead, they just point the heroes on their way and say “Good luck!” Khelben at least has the plausible justification of being busy with running an entire city; Malchor just consoles himself with the excuse that “his days of adventure are behind him” and continues sitting around in his tower. I get that the presence of super-powerful characters is a real narrative problem for Forgotten Realms authors, but if you’re going to include them in your story, you have to explain why they’re not going to use their powers to headshot your plot. Otherwise, they just look like dicks. They’ve done a good job of this so far with Elminster; he spends most of Azure Bonds trying to figure out what’s going on, for instance, and all of the Avatar trilogy hamstrung by the instability of magic. Malchor gets no such excuses. If there’s a theme to be had here, I’d say it’s “Middle Eastern people are generally evil or dishonest.” It’s a pretty terrible theme, and deserves further explanation. Let’s contrast two cities: Waterdeep and Calimport. Waterdeep, the City of Splendors, is the biggest metropolis of the northern Realms. Despite that, it’s well-run, well-policed, and remarkably cultured. Drizzt and Wulfgar pass through it on their journey, where they meet a couple of disreputable characters and a couple of helpful new friends, and are advised not to make any trouble lest they be arrested and delayed. In this and other books, it’s a shining beacon of civilization in an often savage land. Calimshan, the southern homeland of the crime lord Pasha Pook, is a mishmash of every Middle Eastern cultural stereotype you can think of. There are deserts, camels, sultans, slaves, dishonest merchants, grand palaces, ghastly slums, and lots of dark-skinned people. When they arrive in the capital of Calimport, the characters (all northerners) are bemused by the country’s strange customs and aghast at the poverty, social inequality, and lawlessness they witness. It’s described with words like “wretched” and “perverted”. More significantly, at no point is any Calishite character depicted as honest or good. Every single one is some variety of evil, if not a literal monster. In setting up this dichotomy, Salvatore doesn’t stray too far from the usual Western tradition for depicting Middle Eastern cultures, often referred to as Orientalism. Typically, Orientalist works will exaggerate the cultural differences between East and West instead of humanizing the Eastern inhabitants. They’ll approach the depiction of the East from a presumption of Western superiority, implicitly suggesting that Western ways are inherently better. And they’ll depict many or all of the Eastern characters as some combination of backwards, irrational, or morally depraved, with a pass occasionally given to Eastern characters who are cooperating with the Western characters. The end result is a work which supports a Western-centric worldview and marginalizes Eastern culture. There’s so much more to say on this topic as it pertains to the Forgotten Realms, but I think I’ll save a more in-depth discussion until after I get through the Empires trilogy. Drizzt is still just as aggravatingly perfect as ever. Outside of his designated character development thread, at no point in the novel does he do something which could be construed as a mistake. Every time the party is confronted with a deception or an uncertain situation, he immediately intuits the truth and acts on his invariably correct intuition. Every. Single. Time. It’s an issue I was willing to overlook for the first couple of books, but it gets increasingly grating with each successive book — after all, it’s extraordinarily difficult to build suspense if one of the characters can never be surprised, fazed, or hoodwinked about anything ever. On the plus side, his character development in this book isn’t bad. He gets to angst about the identity issues of going among civilized folk in a magical disguise, which, while practical, makes him feel as if he’s not being true to himself. And he gets to analyze the reasons why he’s so dead-set on defeating Entreri, recognizing and conquering a streak of grim bloodthirstiness in himself in the process. It’s all handled with very little in the way of subtlety, but it’s more character development than any of the other heroes get. Catti-brie gets her first novel where she’s part of the protagonists’ team full-time, but she’s still mainly confined to the Manic Pixie Dream Girl role. She’s free-spirited and insightful, and helps the other characters realize truths about themselves, but has no discernable goals of her own. It feels like Salvatore doesn’t have the first idea how to write female characters, honestly. There’s a grand total of two in this entire book, and their goals are simply “help the male protagonists.” What kind of people are they? What do they do when they’re not helping the protagonists? Who knows? This book certainly doesn’t give us anything to go on. Bruenor actually gets a decent story for a while. When last we saw him, he was plummeting into a subterranean gorge on the back of a dead burning dragon. But his improbable survival is actually handled better than I expected; Salvatore gives us a plausible reason why he didn’t burn to death, then shows us the long, excruciating guerrilla battle he has to fight to get back to the surface through an entire city of duergar. Compared to Adon’s survival in Waterdeep, where he just pops up later in the book having recovered from an almost certainly lethal situation with little justification given, this doesn’t feel cheap — you get to see Bruenor earn his survival. But after his rescue he doesn’t have much of a role to play aside from being the comical “fish out of water” character next to the more worldly-wise Drizzt, which is a shame. Regis gets to be the helpless captive in this novel instead of Catti-brie, and he plays the role well. He’s determined to survive, but too terrified of Entreri — for excellent and clearly demonstrated reasons — to mount any effective resistance. His main role in the story is to be the ticking clock that keeps the rest of the heroes in motion, so he gets a number of good viewpoint scenes that convey the peril and urgency of his situation to keep the narrative tension strong. Entreri, the assassin, serves as an excellent foil to Drizzt character-wise. Sadly, they once again spend most of the novel apart, and when they are together it’s not as much fun as the teeth-clenched teamwork scenes from Streams of Silver. Instead, they banter very briefly then spend the rest of the novel determinedly trying to murder one another, which doesn’t make for as many good character moments. His time spent travelling with Regis is generally stronger; you see how he thinks and operates, and watching him leave a trail of corpses behind them without qualms or remorse makes him feel like an actual threat and plays up the distinctions between him and Drizzt. There are a fair number of cutaway scenes involving Pasha Pook and his court, setting up the political situation in Calimshan which the heroes will be slaughtering their way through. They’re pretty decent, actually. Pook himself is full of weaknesses (vanity and overconfidence, particularly), but still smart enough to stay on top of what’s going on and cunning enough to turn each situation to his advantage. His downfall seems to be that his considerable talents are oriented towards intrigue and political power, but not towards dealing with the outside-context problem of four bloodthirsty murder-hobos showing up on his doorstep and destroying everything in sight. It’s a better way to handle an ineffectual villain — he’s not completely useless, just not useful for the current situation. A fair number of words are spent on the wererat lord Rassiter, a comically evil foil to Entreri, but he’s ultimately irrelevant here despite all the talking up he gets. Not even the other characters take him seriously; they’re all just suffering his presence, waiting for the inevitable moment when Entreri snaps and kills him. His only role in the story is to emphasize to the reader what a badass Entreri is, but that doesn’t work when he’s so completely ineffectual and universally despised. When he finally does get shanked, it feels like a mercy kill. Either it’s getting better, or I’m becoming inured to ridiculous prose from reading all these books. I suspect the former; while the style is still overblown and grandiloquent, it feels as if it’s been toned down somewhat from Streams of Silver. I encountered far fewer passages which made me burst out laughing from sheer inadvertent absurdity. Other aspects of the series’ writing haven’t been improving linearly, though. The Crystal Shard staggers under the burden of far too many action sequences, particularly in its battle-heavy final third, and the non-stop excitement gets paradoxically boring after a while. Streams‘ pacing was much better, separating its over-the-top combat scenes with other types of scenes to give the reader a chance to catch their breath. But The Halfling’s Gem marks a return to the excesses of the first book; the final third of the story is a non-stop series of bloodlettings and explosions. After the hundredth time Wulfgar crushes some nameless mook with a hammer, one just sighs and thinks “Okay, I get it already. Can we move the story along instead?” Nope, no such luck. You get to slog through dozens more pages of mindless violence. Salvatore tries to preserve the tension by upping the stakes with increasingly dangerous opponents. Once the humans get boring, bring on the wererats. Once the wererats get boring, bring on the fiends! But they’re all just the same: papier-mâché cutouts for the heroes to smash. I was going to give it a higher grade, but the last third of the book being a long, relentless slog of violence really drained my enthusiasm for the story, and the creepy orientalist stuff drained my enthusiasm for the setting. All that’s left is the characters, and they’re a mixed bag quality-wise. There’s a duergar clan named Clan McUduck. I can only assume their chieftain is named “Scruuge”.